With the explosion in demand (both for consumption and collection) for Japanese whiskies in recent years, Suntory holds a special spot with Japanese whisky drammers with its core whisky portfolio which includes Yamazaki (which we visited last year), Hakushu (which we also visited) and the famous blend Hibiki (not to mention the soon-to-become-mainstream Chita grain whisky). 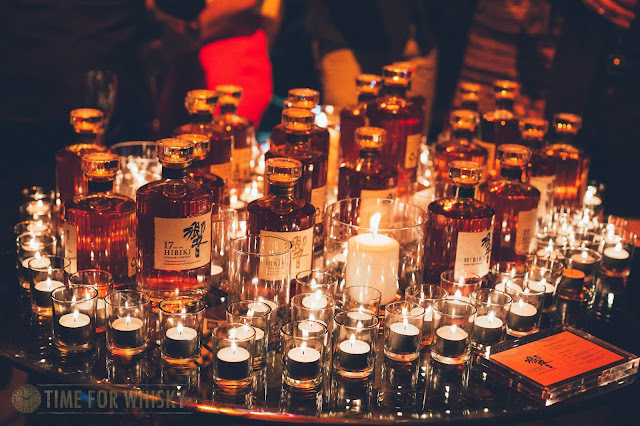 Late last year Suntory Australia officially launched the Yamazaki "Distiller's Reserve" and the Hakushu "Distiller's Reserve" in Australia along with some of its other core range including the Yamazaki 12 Year Old, Hakushu 12 Year Old, Hibiki 12 Year Old and the fantastic Hibiki 17 Year Old (see our coverage of the launch here). Roll forward just under 12 months, and Suntory is back once again to introduce a new NAS (No Age Statement) release, with the new Hibiki "Japanese Harmony" - toted to be a tribute to the original Hibiki blend which was created in 1989 to commemorate the 90 year anniversary of Suntory. 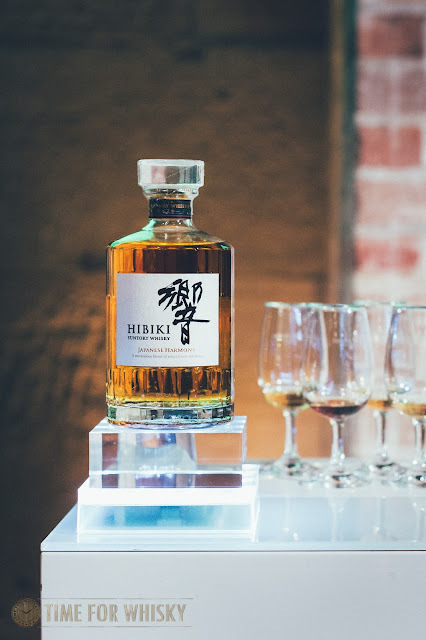 To celebrate the launch of the new Hibiki "Japanese Harmony," Suntory held a launch event at Simmer on the Bay in Sydney's Walsh Bay. The event venue was decadently decorated with tranquil and elegant features and upon walking in, guests were greeted with the sight of a grand centre round table, with the classic 24-faceted Hibiki bottles placed around the tables, surrounded with tea-lights of various sizes (it was later revealed that these bottles were only filled with tea - as display bottles often are). 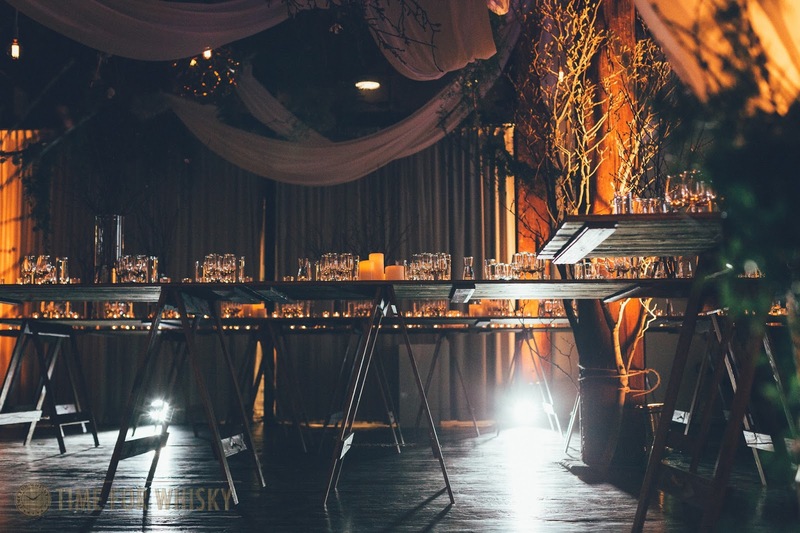 In the adjacent room, rows of tables could be seen featuring the Hibiki component whisky tasting sets. 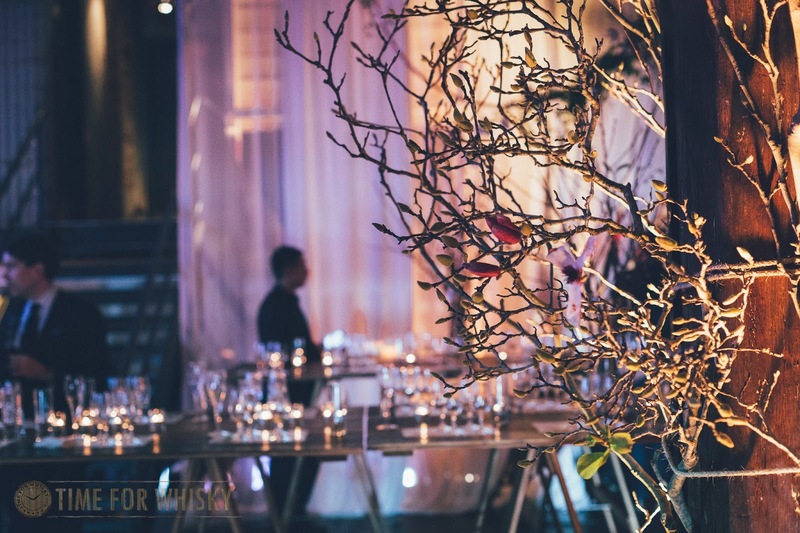 The room had been extensively decorated with tranquility and nature in mind; trees, branches, flowers and honeycomb-inspired lights were installed across the room. 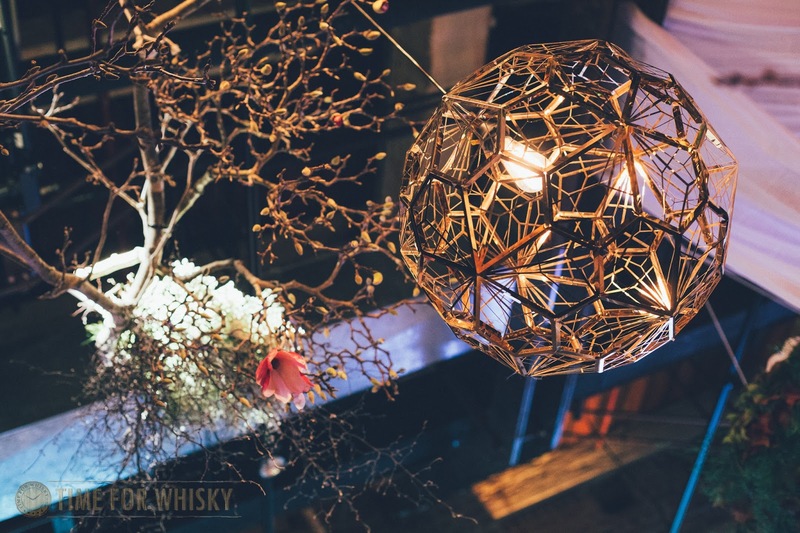 The room design and features very much reflected Suntory's "mission" of being in harmony with people and nature. 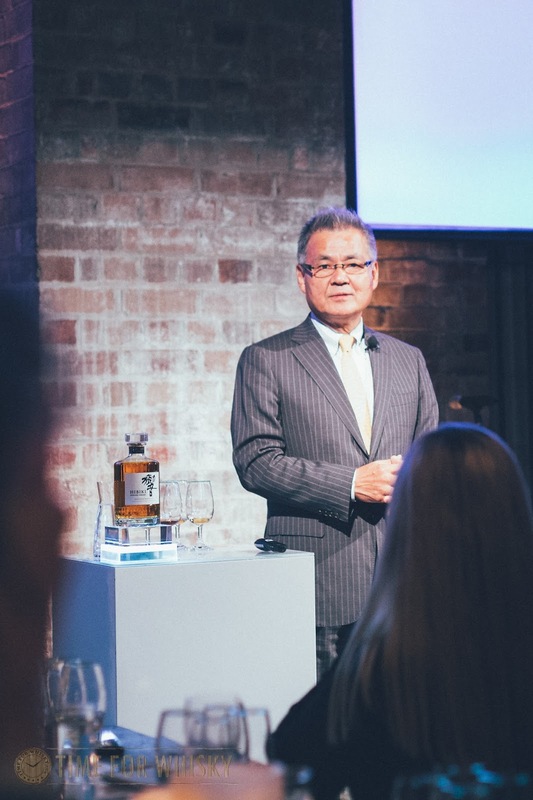 As with the launch last year, Mike Miyamoto, the Suntory Whisky Global Brand Ambassador was the host for the evening. 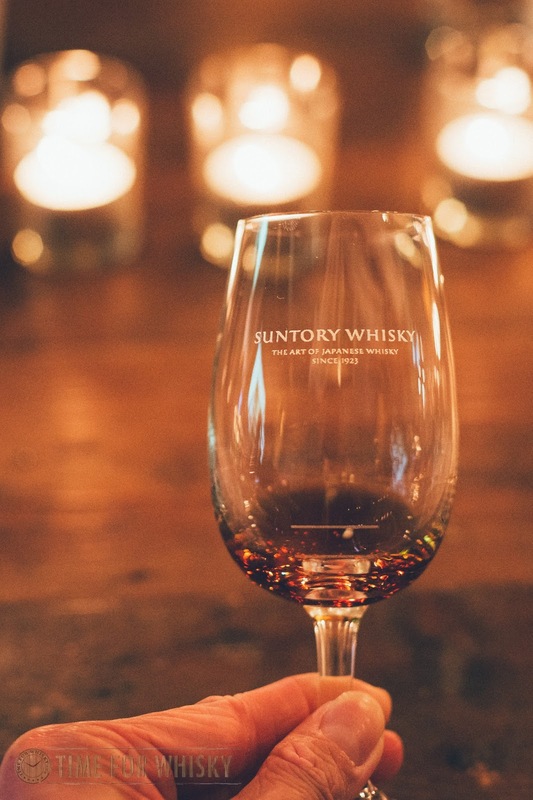 In kicking off the launch, Mike described the extensive journey he embarked on with Suntory throughout the past 37 years, having joined in 1978 at the Yamazaki Distillery before being posted in USA in 1980 to run the cooperage business. Mike also spent some time at the Bowmore distillery between 1994 and 1999 and once again between 2002 and 2004 as the Director of Distillery before becoming the Global Brand Ambassador last year. Following an overview of his time with Suntory, Mike then proceeded to provide a brief overview of the history of Suntory before kicking off the formal tasting of the Hibiki "Japanese Harmony"
Of the five component whiskies, three were presented for formal tasting; being the Chita Grain, the Mizunara Cask as well as the Sherry Cask. 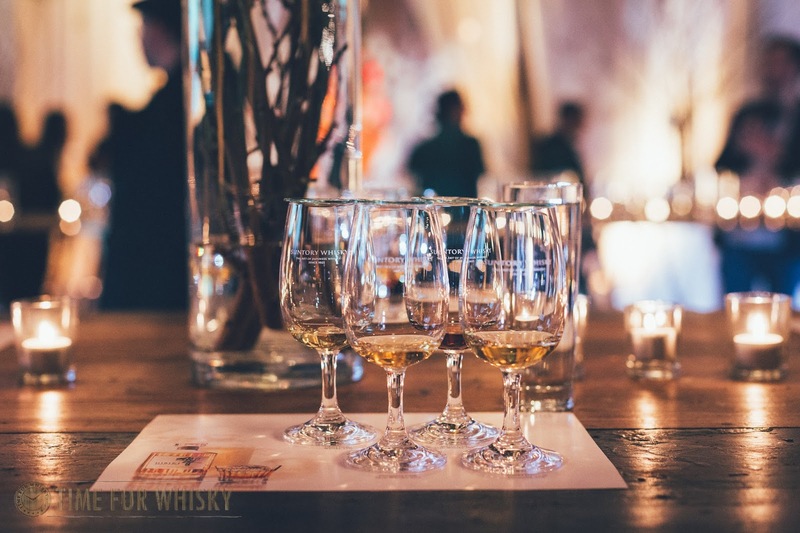 Frankly, the three component whiskies were easily able to stand on their own and were quite exciting to taste. The Chita Grain was the first component tasted - overall, a mild and pleasant dram. With a Chardonnay-like appearance, the Chita Grain nosed of vanilla, lemon cheesecake with a fresh breeze of the morning forest air and wet moss. There was also a hint of whipped butter on the nose. The grain was evident on the palate with a big dollop of corn note that developed into a herbaceous minty and dill profile. The finish was refreshing, mostly from the mint note albeit short. The third component, the sherry whisky component was quite likely the most exciting component of the three. You could almost hear all the pleasantries being shared around the room as we began to taste it. With quite a dark, copper, port like complexion, the sherry component was sweet, fruity and complex on the palate. The nose was filled with sherry, vanilla with a hint of oak. The palate was soft, refined and starts off with a vanilla note followed with oak and then a layer of peat. The finish was long, gentle and tended to coat the palate. A clean, simple Hibiki blend that may not be as prominent and bodied as the 12yo or the 17yo though the Japanese Harmony can stand up as your daily dram or a dram on a nice warm day, served as a Highball given the light, crisp profile. Palate: The Japanese Harmony carries a clean, soft yet buttery characters on the palate. Note of popcorn is there that develops further into notes of sherry with soft, gentle spices. Until then, we have the Hakushu and Yamazaki Distiller's Reserve, the Hakushu and Yamazaki age statement whiskies and now, three Hibiki expressions to enjoy.